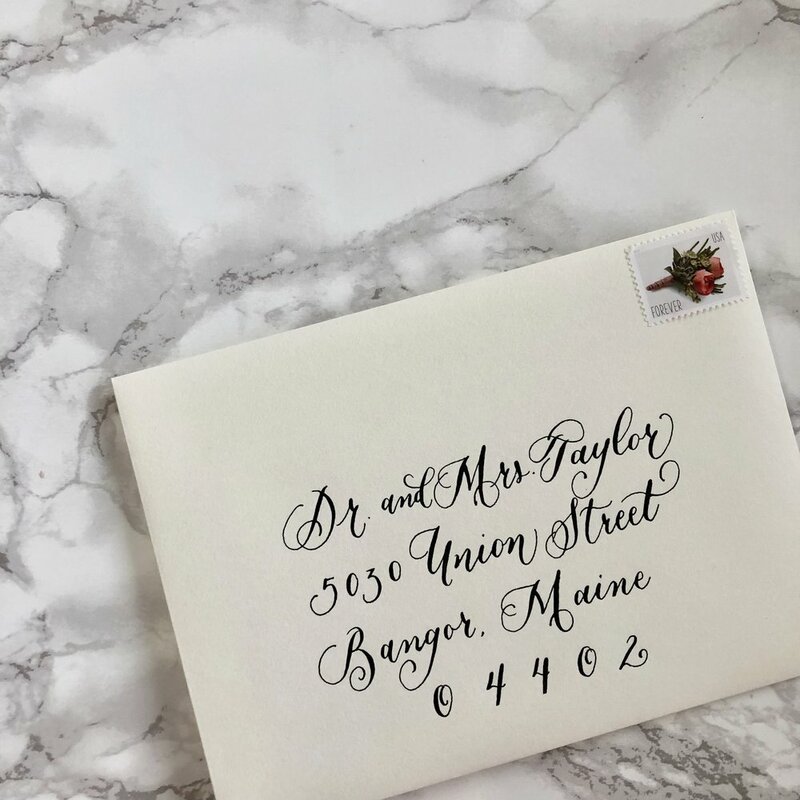 Now that you’ve decided on wording for your wedding invitations, it’s time to move forward with guest addressing. So, what’s the correct etiquette to use when addressing wedding invitations? For some weddings, there may be an inner envelope to accompany the more formal outer envelope. Titles on the inner envelope can be less formal and more personal depending on your relationship with the guest. The outer envelope is where things can get tricky when it comes to titles, full names and correct spelling. 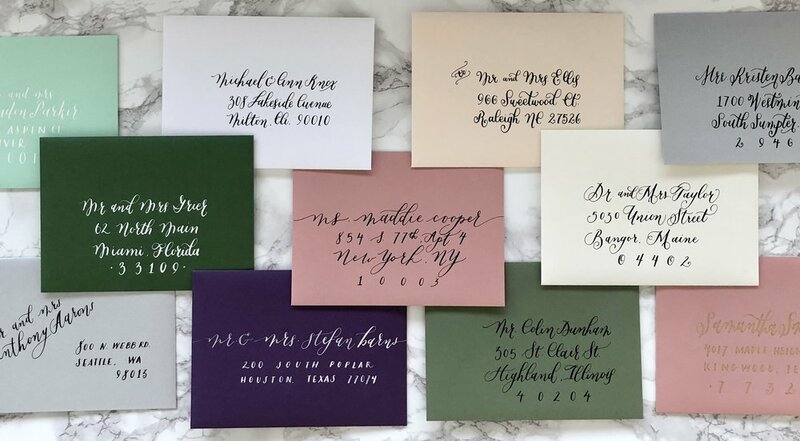 Here are several variations of how to address wedding invitations to your guests. For couples with the same last names, use titles “Mr.” and “Mrs.” followed by the husband’s first and last name. For couples with different last names, make sure to write the wife’s name first followed by the husband’s name. If the names are too long to fit on one line, they can be placed on two. It’s becoming more common for couples to cohabitate even if they are not married and sharing the same last name. In this case, list the guest you are closest to first followed by their partner’s name. You can list either guest first depending on your relationship with each individual or you can simply list them in alphabetical order. Outer envelope: “Mr. Jack Stevens and Mr. John Wilson” or "Ms. Jan Johnson and Ms. Jane Smith"
Inner envelope: “Mr. Stevens and Mr. Wilson” or “Jack and John” and "Ms. Johnson and Ms. Smith" or "Jan and Jane"
List the guest who is a doctor first with titles spelled out on the outer envelope. If both names don’t fit on one line, you can place them on separate lines. The same rules apply to guests with titles such as judge, reverend or military personnel. In this case, you will list the guest with the title first followed by their partner’s name. You can address the guest as Mrs. or Ms. along with her ex-husband’s last name if she still uses it or you can also use her maiden name. This can be addressed two ways: She can be addressed by her married name or by her husband’s name. In this case, it’s best to ask someone who is close to the guest, such as a family member of the widow. What if I am not doing inner envelopes? No problem! These days, a lot of people don't do inner envelopes and that is totally fine. It will save you money on invitations, and they may not always be necessary. If you want to be clear that children are not invited, for example, inner/outer envelopes are a great tool. For my wedding, we had about 15 addresses with both inner and outer envelopes, the rest we just sent with one! That way the guests with children knew for sure they were or were not invited, and it saved us some money on envelopes by not doing them all. Miss Laney and Miss Annie"
"Mr. & Mrs. Jeremy Smith and Family" or as stated above, "The Smith Family"
Keeping track of all your guests can be stressful. If you're a current or future client, this is the format we need for address printing. If you're having your guest addresses printed else where, this will probably still work! (please check with your printer) Whether you're having your addressing done professionally or not, this file will definetly help you stay organized! The freebie includes 2 sheets: One with all your guests addressing info, and another to help you track their RSVPs, meal options, and more!